It’s August and the weather slowly, slightly begins its shift. The summer breeze, which envelops you in a blanket of warmth, surprises you with a gentle chill that nips your neck; just a small reminder that fall approaches. With summers end the cool crisp air reminds us that classes will commence. With them the weight of deadlines, projects, essays, research and more follow. Until one day, it doesn’t. Everything that we seem to dread about school while we are living in a whirlwind of information is what we miss when we find ourselves away from it. Though this might not be true of everyone, and though we night not necessarily miss it, we certainly need it. As a freelancer I need the guidelines of an assignment. I crave deadlines, which make a once empty portfolio enriched with work. I thrive on the very foundation of school, after 22 years learning who doesn't?! So what do you do to fill in those essential gaps that keep the creativity and learning process going? You start small. You create little projects with deadlines of your own. You would think this is a simple enough concept but you’d be surprised how difficult even this little task may be. We think there is no punishment for lack of work. Well, no actually, if there is no work to perpetually move you forward as an artist what else is there? And so, in order to bring myself back to the rigid ways of educational deadlines, Brian and I came up with a plan. Brian Tortora of tortoravisuals.com and I decided to engage in a structured competition. This wasn’t elaborate. We kept it simple. We agreed to go out after a snowstorm and take pictures. We had 30 minutes to shoot. We would take separate cars. When the clock ran out we would head back to headquarters to edit. Where we then had 30 minutes to transfer files, make the edits and process. And so we did just that. Some odd weeks ago we posted the images and asked for votes. Most might have glanced at the pictures and some willing participants voted! Which was incredibly encouraging. This small task is fulfilling enough to keep us moving forward and to keep us creating new work. Now, onto the next project. As for the winner, Brian won most votes for the door image and we both tied for the reflection. **I'd love to hear suggestions! Email me with any! When worlds come together to create something beautiful: Behind the Scenes with Bob Packert. The prodcution took place up north, far north where the ground accumulates generous snow and the elevation gently takes your breath away. Well no, not really we were only out in the woods after all. Though nature does evoke feelings of a far off land. The roads were unpaved and the trees, though barren, were lush with empty branches. The evelvation didn't really take our breath away; the cold air might have consumed us but even the cold could not prevent this production from unfolding. Along with their talents, every single person brought with them an air of enthusiam. And that equated to a well oiled machine. The moving pieces flowed effortlessly. Every detail from the attire/jewelry, hair/makeup, location and so forth were well thought out and executed. Even the weather decided to play a part gracing us with a few snowflakes for at least part of the day. Here are some images of what took place on that shoot. Enjoy. Anna, the brave wild woman out in the middle of the ice. Getting ready for another scene. Kristy with Anna for the outfit changes. Jenny finds a second to elevate her cold feet between outfit changes. Dawn with her amazingly wild hair piece created by Jeni. Jeni and Carmen attaching Carmen's unique branch design. Jeni's brilliance illuminated through Anna's eyes. Bob directing another incredible scene. Carmen with Dawn between outfit changes. When worlds come together to create something beautiful: Behind the Scenes with Bob Packert and all of these other amazing individuals. Models: Anna Aleksandra Jonynas with Dynasty Models and Talent | Dawnmarie Currier with Maggie Models Inc. I am always amazed at the opportunities we get in life. With photography these opportunities always seem surreal, at least it does for me. I recently assisted Brian (from tortoravisuals.com) to shoot a video for an event for Bentley University. Frozen Fenway 2014 hosted college hockey teams to play in the rink at Fenway Park. These players were dedicated and professional and most importantly, they were passionate. They looked graceful skating under the lights at Fenway. And the fans, though cold were all excited to be there. And I felt honored to be able to walk past the dugout, through the narrow hallway enriched with history. Through this hallway, footsteps led players and others to realized dreams and opportunities. I hope it gives these hockey players the same kind of fortune. the photo as a judgment that the photograph is good." I saw these words Garry stated and immediately thought that this is too true. I find that I have done this far too often, especially in the earlier stages of my career. Before a formal education the only way I really knew my way around a camera was with a book in hand. Then I learned the specificities that first year at photography school and could gracefully stumble through the settings to at the very least appear like I knew what I was doing. It was during this period of time I realized I still needed subjects that weren’t things. Learning the cameras ins and outs were difficult enough, now I had to factor in a person!? On top of it all I factored in the rejection, which played far too large a possibility that I generally opted for the more stable subjects, the static. Needless to say taking pictures of people was my greatest obstacle. Trees were my best models, buildings, homes, leaves and so on. When school required other less willing models I’d panic. When we had an assignment I had to work up enough courage to ask an approachable person. At this point I did not care what the person looked like or what kind of “story” I would want to describe, I just wanted a damn picture of a person. And when the subject would cooperate, I became overwhelmed at the prospect. I would have a picture … of a person!! No, this was too much for my poor armature heart to bare. A few clicks later and I had it! Of course I had it, the moment felt too good for the pictures to be anything else but the most wonderful capture! Quickly rushing with the sense of elation towards a computer the feeling of happiness lingered. The images couldn’t import quickly enough. I would scroll through these pictures in anticipation, looking for the perfect one, the one I had taken just moments before. When I reached the end and did not come across this image I must have somehow concocted, the dejection would inevitably stroll in and wipe out any happy feelings that remained. I would feel disappointment for I had the cooperation, I had the model, I had the camera and everything with the possibility to make a decent enough image. Yet somehow in the midst of all those good feelings, I missed. I did not even hit the target! Did the feelings overcome all other emotions and steer me away from all instincts that tell me what makes a bad image? I’m not sure but I what I did not have was a good image. 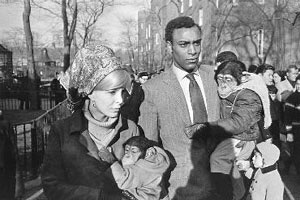 And here is where Winogrand’s words hit home. As a photographer I need to do more than point the camera and take a picture. I need to multi-task between handing clients, composing a picture, changing the settings and emotion is just another aspect I need to control. I look at Garry’s images and wonder what he might have been thinking. He certainly did not let his focus wander. For all those who are just starting out, maybe this is a good point to consider. I look back and think so many bad pictures could have been avoided or maybe I needed to let them get out of my system! Either way, I definitely see things differently now, for better or worse you tell me! This is my first blog post, ever. I'm really behind the times here when it comes to establishing a relationship on social media. Let's call this our awkards first date. With the continuous encouragement (or as my mind percieves it non-stop pesterting until I published this) of Brian (www.Tortoravisuals.com) I decided that now is as good a time as any. So here we are. I'm not really sure where to start or what to say so I'll keep it short for the moment. I'm a photographer (like that wasn't obvious before ... I told you this was going to be awkward) and I love what I do. I'm enthusiastic when it comes to learning and I can't possibly learn enough. If you ever have any advice or new tricks ... please let me know!!! With more blogs and as we get to know each other more with time I hope to hear from you and what you think of the work, ideas, comments, suggestions etc.